Downbound in the Seaway near Cote Ste. Catherines, July 17, 2010. Camilla Desgagnés was built by Kroegerwerft G.m.b.H. at Rendsburg, Germany, as Hull 1506 and launched on February 17. 1982. This general cargo – Ro/Ro vessel measures 436 feet, 4 inches in length, 67 feet, 7 inches at the beam and has a molded depth of 46 feet, 3 inches. Tonnage was listed at 10,085 gross and 3,026 net registered tons. It was completed as Camilla for Lundqvist-Rederierna of Finland and powered by a Model 12TM410 Werkspoor diesel engine that developed 7,797 brake horsepower and gave the ship a service speed of 13.7 knots. It specialized as a paper carrier with accommodations for 12 passengers. The cargo shifted aboard Camilla on January 23, 2003, and the ship lost power and developed a severe list to port in heavy weather off the coast of Newfoundland. The 16-member crew was airlifted to safety by helicopter when Camilla was in danger of being lost. The tugs Kigoria and Ryan Leet took the listing freighter in tow and they reached St. John’s, Newfoundland, on February 12, 2003. Camilla was righted, unloaded and eventually sold to Royal Bank of Canada. The name was listed as Camilla I before being placed on a bareboat charter to Desgagnés Transarctik Inc. 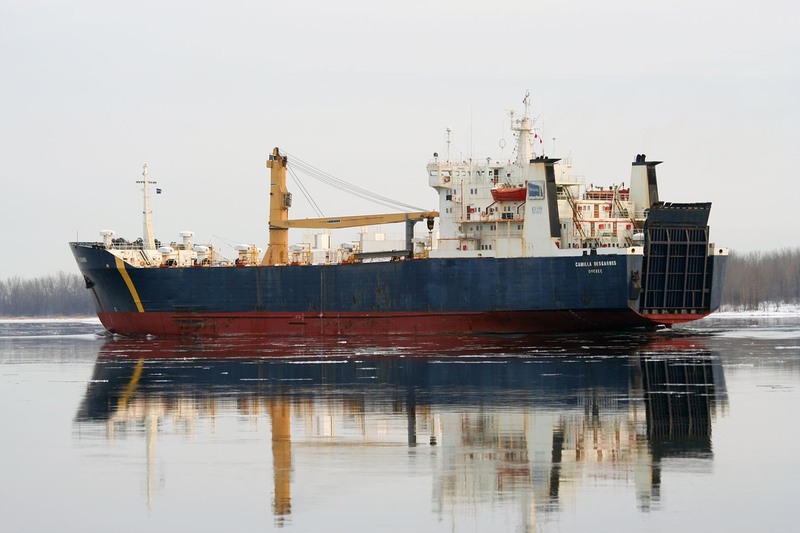 The vessel was re-enrolled at Quebec City as Camilla Desgagnés (C825762) on or about February 10, 2004, and classed as Lloyd’s +100A1 Ice Class 1A Super. By 2005, a deck crane had been installed. On June 8, 2005, while in Long Island Sound on a voyage from Poughkeepsie, New York, to Saint John, New Brunswick, Camilla Desgagnés suffered a fire in the engine room. Although the blaze was extinguished by the crew, they were removed from the ship and it was towed to Port Elizabeth, New Jersey, for repairs. These were completed on June 10 and the ship returned to service. On September 4, 2006, soon after departing the Arctic community of Mittimatalik, formerly Pond Inlet, there was a total engine failure and the Canadian Coast Guard ship Henry Larsen towed Camilla Desgagnés to Milne Inlet where it was anchored. The deep-sea tug Ocean Foxtrot was dispatched from Baie Comeau to tow Camilla Desgagnés to Halifax for repairs and the pair arrived there on October 16, 2006. The ship was transferred to Barbados registry on February 14, 2007. The next year it accomplished a historic voyage ending on November 28, 2008. Camilla Desgagnés became the first commercial vessel to transit the Northwest Passage, in both directions, during the same season. It had delivered supplies to the Arctic communities of Cambridge Bay, Kugluktuk, Gjoa Haven and Talayoak before returning east. On October 27, 2009, shortly after taking on a pilot at Escoumins, Quebec, the ship suffered a violent explosion in the main engine that blew internal parts through the engine block. Fortunately, no crew members were injured and the ship was able to reach a safe anchorage with the aid of the pilot boat Charlevoix, C.C.G.S. Hudson and C.C.G.S. Martha L. Black. The tug Ocean Raymond Lemay was dispatched from Quebec City to tow the damaged ship to port and they arrived at Quebec City and moored at Section #103 the next day. The apparent cause of the explosion was a broken connecting rod. The vessel was repaired and returned to service in 2010. In December 2017, the Camilla Desgagnés was sold and renamed Camilla D. She departed Trois-Rivières, Quebec, on January 25, 2018 bound for further service in St. Petersburg, Russia. Adapted with permission from "The Desgagnés Fleet" by Buck Longhurst, Mac Mackay, Skip Gillham. Laid up and awaiting repairs in St. John's, Newfoundland, May 20, 2003. Upbound near Quebec City, Oct. 27, 2005. Close up of the stern cabins. Secured at Sec. 25 Port of Montreal, June 12, 2008. One of the tugs taking a load by barge to shore. There are no docking facilities for large vessels in most Arctic communities. July 26, 2009. Tugs loaded on deck. These little tugs push the loaded barges to shore. Stacked empty barges can be seen just astern of the tugs. July 28, 2009. Umivjag, one of the Arctic communities, July 29, 2009. Laid up for the winter in Montreal, Feb. 7, 2012. Departed Montreal downbound, Jan. 2, 2017.